My family and I stayed at the river house for 4 nights and it was perfect!...ya hear me?....perfect. This property was absolutely beautiful and relatively private. It was a great size for the price. 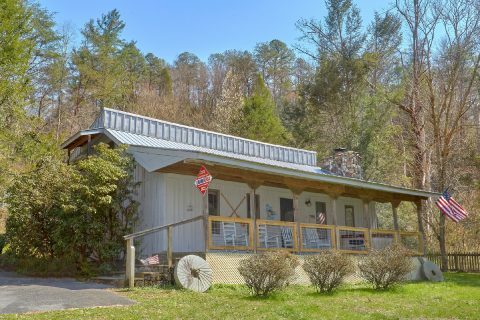 We loved being right in front of the Little Pigeon River and having a hot tub and a covered porch with rocking chairs overlooking it. It was so lovely and relaxing to sit by the bank of the river and just enjoy the sounds of nature. The property management company was absolutely fantastic and we would recommend them highly for booking. We would definitely go through them again. The only complaint that I have is that the furniture is quite worn. The couch and both mattresses were VERY uncomfortable so we woke quite sore each morning and had difficulty relaxing on the couch to watch television. Aside from that, this was a wonderful experience and we did not want to leave. Loved almost everything about the stay. The staff and owner were very responsive to our needs as there were few hiccups but issues fixed very quickly and overall it was a great stay. The river, porches and hot tub were great... If I had to suggest anything, the grill needs updating and the cabin needed to be freshened up, it was a tad musky smelling. That's really all I can suggest. I was kinda shocked at all the fees but after seeing and hearing the river and porch I was hooked. We loved the riverhouse it was so great. Beautiful cabin plenty of space for 3 to 4 people. The river was calming and relaxing. The only 2 things i would change would be to cut down the weeds and a few bushes by the river and gazebo so you could see the river better. And to make the steps going upstairs wider they were way to steep. I would absolutely go back there it was a great cabin. Clean, spacious and beautiful. Code didn’t work when got there and cleaning had not been done. Had to wait to get into cabin. Beautiful cabin on the river. Easy accessible to attractions . It was great except the bed downstairs which we used.. needs a new mattres. This one rolls to the middle and is very uncomfortable. Everything else was great! It was a nice comfortable cabin the only complain I had was we didn’t have enough toilet paper or paper towels. And the toilet was pretty dirty but overall was a good stay. The cabin was beautiful. Love the location along the river with easy fishing access! My only complaint is that the grass was pretty high and needed to be cut. I would recommend this cabin to anyone who plans to fish or just wants to sit and listen to the water rolling over the rocks on the river! Very peaceful place! We enjoyed our stay at the River House. The property was exactly what we were looking for. The view was beautiful as well. We enjoyed the hot tub and pool table because it gave us something to do while at the cabin. My fiancè spent most of his time fishing where he caught several fish and also encountered snakes. It would have been nice to have the bank cleared off so there were more room and more visibility. I enjoyed being able to eat outside, which we did most of the time. The only problem we had were the beds. They weren't comfortable at all. My fiancè didn't get much rest, and that was a huge concern. Also the electric can opener did not work. And the 2 hand operational ones were junk. We would definitely recommend this property to anyone looking to relax and be secluded. We look forward to our next stay with Cabins USA. This is by far the best trip I've ever taken. The drive thru the mountains to the cabin was incredible. Very beautiful cabin and secluded. It had everything we needed and more. The bed was comfortable, the cabin was clean, the hot tub was relaxing and clean, the decor is fabulous, and the view is amazing. We used the fire pit and fire place and they provided plenty firewood. We sat on the river bank watching the water flow down the stream and the sound of the river just lovely. We didn't use our phones, no tv, and no radio, and it was just perfect. I could go on and on, but to sum it up I would definitely go back to the River House. Thank you for a wonderful stay. God bless. Cabin overall was satisfactory, the bed was not the most comfortable. It was nice quiet area. I have stayed in this rental twice and enjoyed my stay both times. Only a couple things that I would recommend that would have made my stay more enjoyable. The pool table needs to be leveled and it would have been great to have a TV in the bedroom. I would recommend and will probably stay there again.